Azimut Benetti Group will present 26 boats this year at the Genoa Boat Show, including four of them in a world première, and three of them never seen before in Italy. We'll focus on the those exceeding 24 metres, the new Magellano 76 and the Azimut 84. The Magellano 76 is the evolution of the Magellano 74. Designed by Ken Freivokh, this 24.40 metre motor yacht differs from her predecessor with an extended flybridge and more volume inside, increasing the comfort for guests and crew. She accommodates eight guests in four cabins: a full-beam master, a VIP and two twin cabins. The Magellano 76 is powered by twin 735kW MAN engines, giving a top speed of 22 knots and a cruising speed of 17 knots. 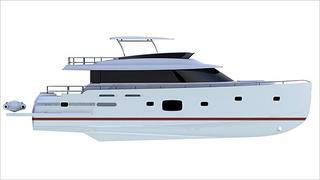 The Azimut 84 is the latest model from the Flybridge Collection, successor of the 82 series. Designed by Stefano Righini, this 25.69 metre motor yacht is built in composite. Her interior, by Achille Salvagni, accommodates eight guests in four cabins: a full-beam master, a VIP and two twin cabins. The Azimut 84 is powered by twin 1,267kW Caterpillar engines, giving a top speed of 29 knots, a cruising speed of 24 knots and a range of 320 nautical miles at the economical speed. Paolo Casani, CEO of Azimut Benetti Group, commented: 'Genoa is the ultimate Italian Boat Show. And we, who have built our business around Made in Italy quality, shall be there this year too with an impressive presence.' The 52th Genoa Boat Show will start tomorrow morning until the 14th October.